Note: With preschool-aged children the activities should be open-ended. It is the experience and not the end product that matters. a) Write Ramadan Kareem (or Mubarak) in the middle of a large cardboard. Discuss the meaning of the words. Let the children decorate with glitter paint, stampers, bits of cellophane, foil paper anything that looks nice and can be glued. b) Make Ramadan Kareem/Mubarak cards. Look at the night sky on a cloudless night and children describe what they see. Be sure to point out the stars and moon crescent. Remember to discuss the importance of moonsighting to indicate the start of Ramadan. Once inside children can dictate to the parent/teacher what they have seen. The parent/teacher writes it down and let the children draw pictures to accompany the writing. After viewing the night sky, let children paint the night sky by using yellow paint on black paper. An alternative to using a paintbrush is to use a cotton bud. Make a calendar out of A3 cardboard with Ramadan pictures pasted around the outside and an A4 calendar grid in the middle. Hang this chart on the wall throughout Ramadan. a) Have a group discussion based on the pictures, be sure to discuss the importance of Ramadan. Discuss the numbers on the calendar grid and count to 30. For the 1st day of Ramadan tell children that today is 1 of Ramadan. Do this everyday until day 29 or 30. When it is Laylatul Qadr have the discussion on it, showing children that it is within the last 10 days. Make special stickers to stick on the days. 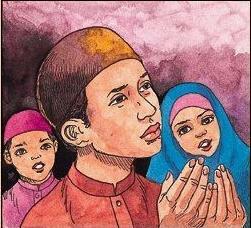 When it will be Eid have a discussion on it, showing children that it is the day after Ramadan. Make a special Eid sticker to stick on the Eid day spot. On each day children do tracing of the corresponding number of the day, ie. 1st of Ramadan children trace number 1 and so on. Ramadan is here today, lets all fast. Everybody fast and pray, and be good. Recall that Ramadan is not eating and drinking during the day but we also have special food that we prepare for suhur and iftar. If there is a group of children, ask each child what they eat during Ramadan. Make a list and try to find pictures of them and easy recipes. b) Math: measurement; Science: reaction, change of state. (i) Hadeeth on breaking with date. Each child to eat a date or taste a bit. Describe the taste (sweet). Discuss that it is this sweetness that gives us energy quickly. (ii) Discuss what happens when we eat too much. Hadeeth on eating in moderation. PDHPE: health, nutrition; scissor skills and fine motor skills. Prepare flashcards of different types of food. Ask children which are the healthy food and which are not. Children cut out pictures of healthy food to eat for suhur and iftar. They paste the pictures onto A3 cardboard to make a poster collage. Hang on the wall. Prepare A5 flashcards by drawing silhouettes of pictures of good deeds. Ask children what the pictures represent. Discuss the deed and how Allah loves those who do good deeds and rewards more in Ramadan. Get your children to join you in Taraweeh prayers at home and at the masjid. (i) See Days of Ramadan b under calendar. (ii) Just as we recite Quran before we do anything, for Ramadan recite surah Laylatul-Qadr before every lesson and, insha Allah, over the period of 30 days they should pick some of it up. Explain/Discuss the meaning of the surah. c) Make an Eid collage poster with the words Eid Mubarak on large cardboard. Decorate with the usual materials (see 1. Ramadan Kareem).